MONTEREY, Calif. — Gil de Ferran made his last qualifying run in style Friday at the famed Laguna Seca Raceway by capturing the overall pole position in his No. 66 XM Satellite Radio Acura ARX-02a prototype sports car for Saturday’s Monterey Sports Car Championships. De Ferran, who’ll retire from active driving following Saturday’s four-hour feature, started his special retirement weekend with an impressive pole run with a time of one minute, 11.206 seconds and a speed of 113.148 miles per hour to edge fellow Acura drivers David Brabham and Luis Diaz. This was de Ferran’s third 2009 pole run. The Acura 1-2-3 sweep marked the fifth time the automaker has taken the top three qualifying positions in the ten-race 2009 American Le Mans Series. The de Ferran celebration began on Thursday with the unveiling of the special white livery of the No. 66 Acura in honor Gil’s former CART team owner Jim Hall, who brought two historic Chaparral sports car to Laguna Seca this weekend. De Ferran won his first CART race for Hall in 1995 at Laguna Seca in the No. 8 Pennzoil car which also was on display this weekend. In addition, de Ferran is the Grand Marshall for the Monterey event. De Ferran, who’ll co-drive with Simon Pagenaud Saturday, had to fight off the challenges of Brabham and Diaz late in the 20-minute qualifying session. The pole was the seventh for de Ferran Motorsports in 2009. Brabham, the current LMP1 point leader with Scott Sharp, was less than a tenth of a second off de Ferran’s pole time with 1:11.298 and 113.002 m.p.h. in the No. 9 Patrón Highcroft Racing Acura ARX-02a. Brabham and Sharp can clinch the LMP1 team and driver titles Saturday by completing 70 per cent of the four-hour contest. Diaz, who teamed with Adrian Fernandez this year to sweep the LMP2 class driver and team championships, was attempting to pull off a huge upset Friday by driving his No. 15 Lowe’s Fernandez Acura ARX-01b LMP2 car to the overall pole. The personable Mexican driver set the pace throughout the qualifying session before de Ferran and Brabham nipped his clocking of 1.11.310 and 112.983 m.p.h. The four-hour 2009 ALMS finale is set for 2:45 p.m. [PDT] Saturday on the 2.238-mile, 1-turn circuit. 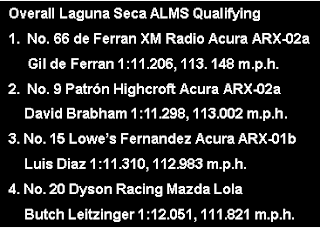 GIL DE FERRAN (#66 XM Radio de Ferran Acura ARX-02a): "This was my last qualifying session, and it is emotional to win the pole today. Laguna Seca is a special place for me. I won my first U.S. race here. But when you strap yourself into the car, you do not think about anything but going fast for the pole. I was really driving hard and sliding the car like a go-kart today. This is exciting. But we have to remember we have a four-race on Saturday. Winning that race is our main goal." LUIS DIAZ (#15 Lowe’s Fernandez Acura ARX-01b): "This is a special weekend for the Lowe’s Fernandez team. It is an end of an era for us. And what a way to go out with class championships. We have a chance to tie the Penske team with the most LMP2 class wins at eight. That is our desire on Saturday. We went much faster today than I thought we could. It feels great to qualify close to Gil and David with our LMP2 Acura. The Acura car has been tremendous all season and we want to finish with a win." DAVID BRABHAM (#9 Patrón Highcroft Racing Acura ARX-02a): "This has been a tough weekend so far for our team, as we have several crew members with the flu. But that will not hinder our goal to win this championship. We’ll be ready for the race."